We continue to see extremely wild swings on Wall Street. On Monday, at one point the Dow Jones Industrial Average was up 352 points, and then later it was down 566 points. At the closing bell the Dow had officially lost 245 points, and all of this extreme volatility is making investors very nervous. Investors like markets that are predictable, because it is a whole lot easier to make money when things move in a predictable fashion. When things get crazy, a lot of investors pull their money out and wait until things settle down in the marketplace, and that definitely makes a lot of sense. Right now, there is a lot of uncertainty about where things are ultimately headed. Some experts believe that the bull market will resume after this “correction” is over, but others believe that a bear market has now begun. And as you will see below, the fact that the S&P 500 has now broken a major trendline that has not been broken since 2009 is strengthening the case of the latter group. Tech stocks got hit harder than anything else on Monday, and at this point they are down 13.3 percent from the peak. Each one of the FANG stocks is now in bear market territory, and many on Wall Street are stunned that this has happened so quickly. But as I have warned my readers many times, markets tend to go down a whole lot faster than they go up. President Donald Trump’s administration is prepared to announce tariffs on remaining Chinese imports if talks next month between Trump and Xi Jinping do not yield results, Bloomberg reported. Such a move is likely to prolong the standoff between the U.S. and China over trade and is expected to hurt the global economy. 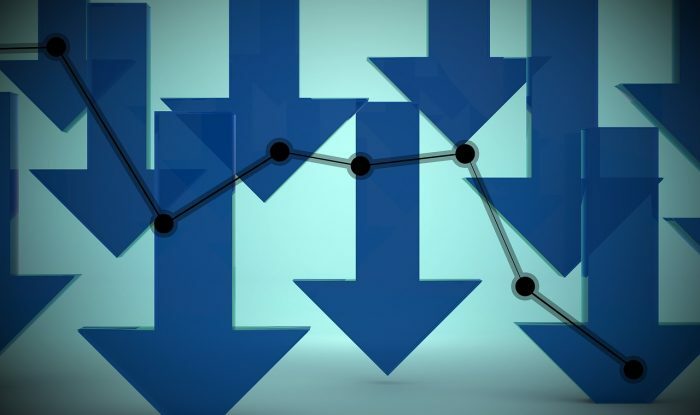 Analysts are also blaming the stock market’s weakness in October on a variety of factors, including worries that U.S. corporate earnings growth has peaked and fears of a U.S. monetary policy misstep by the Federal Reserve. The Chinese do not respond well to threats and intimidation, and our relations with China are the worst that they have been in decades. This is going to have huge implications for all of us, and this is a major storyline that we will want to revisit again and again in the months ahead. Getting back to the market, we are starting to see things happen that we have not witnessed since the last financial crisis. That’s bad news. But unfortunately it gets worse from here. Stocks have violated the monthly trendline running back to the 2009 for the first time in this bull market. So when we talk about the bull market ending… we’re not just talking about the 2016-2018 run… we’re talking about THE ENTIRE bull market running back to the 2009 bottom. You can see the chart that he is referring to right here. The fact that this trendline has now been broken is a huge sell signal, and it is yet another indication that a new financial crisis has begun. And it isn’t just the U.S. that is in trouble. In fact, the U.S. is still in much better shape than the rest of the world. Right now, approximately 58 percent of the 2,767 stocks listed on MSCI’s global index are officially in bear market territory. There have only been four times in Jim Cramer’s career when the stock guru and former hedge fund manager sold out of his entire portfolio. And, scary as it sounds, the market action of the past few weeks reminds him of those chaotic moments. “As much as it pains me to say this, the current situation combines … some of the worst characteristics of those four past breakdowns,” Cramer told investors on Monday as much of the stock market slid into correction territory. Hopefully we will see a bounce on Tuesday and things will settle down on Wall Street for the rest of this week. But whether that happens or not, this crisis is far from over. Stock prices should have never gotten this high. The only reason they reached such absurd heights was due to unprecedented intervention by the Federal Reserve. And now the Federal Reserve seems determined to burst the bubble that they originally created, and that is going to cause immense pain for investors. In order for valuations to return to their long-term averages, stock prices would still need to decline another 40 percent from current levels, but because our system is so leveraged a decline of that magnitude would be absolutely crippling for our financial system and would create the greatest credit crunch that any of us have ever seen. And a credit crunch of that magnitude would instantly plunge the U.S. into an economic depression. This financial bubble has lasted for much longer than it should have, but we desperately need it to continue, because the alternative is an economic horror show of unprecedented magnitude. Unfortunately it appears that this bubble is now bursting, and that is extremely bad news for all of us. The Last Days Warrior Summit is the premier online event of 2018 for Christians, Conservatives and Patriots. It is a premium members-only international event that will empower and equip you with the knowledge and tools that you need as global events begin to escalate dramatically. The speaker list includes Michael Snyder, Mike Adams, Dave Daubenmire, Ray Gano, Dr. Daniel Daves, Gary Kah, Justus Knight, Doug Krieger, Lyn Leahz, Laura Maxwell and many more. Full summit access will begin on October 25th, and if you would like to register for this unprecedented event you can do so right here.